First of all Happy Thanksgiving to all DXN USA Members and Friends! In observance of the Thanksgiving Holiday, DXN USA office will be open from 9am to 2pm (PST) on Wednesday, November 26th and will be closed on Thursday, November 27th, and Friday, November 28th. DXN US Office will reopen on Monday, December 1st at our Normal Office hours. Buy one of these Six DXN Season Promotions for this Holiday Season as Gift for your loved ones. 1. Buy 3 DXN Roselle Juice and get 1 FREE. 2. Buy 3 DXN Tea Latte and get 1 DXN White Cofee Zhino FREE. 3. Buy 3 DXN White Coffee Zhino and get 1 DXN Tea Latte FREE. 4. Buy 3 DXN Cordyceps Capsules and get 1 DXN Cordyceps Cereal FREE . 5. Buy 2 DXN Potenzhi 90 Capsules and get 1 DXN Potenzhi 30 Capusles FREE. 6. Buy 2 DXN Bee Pollen Capsules and receive 1 DXN Yellow Bag FREE . 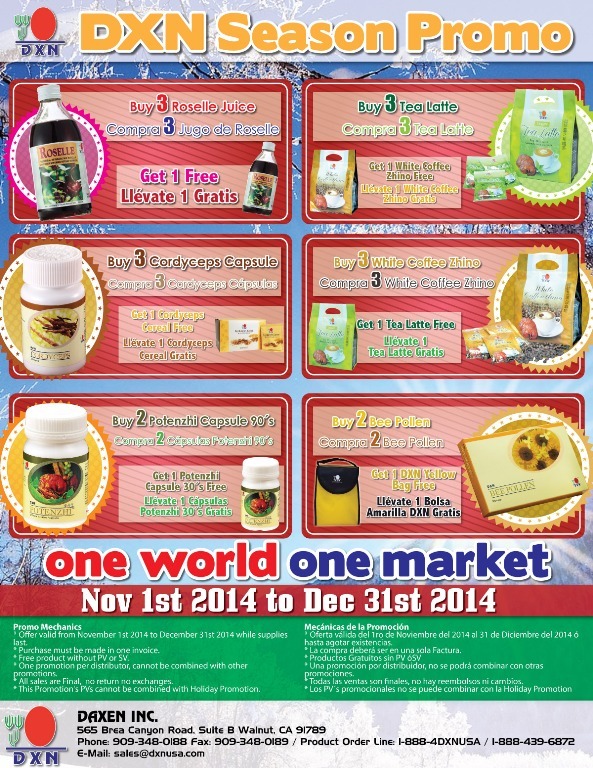 This DXN USA Season Promotion is valid from November 1st 2014 to December 31st 2014 while supplies last. – One promotion per distributor, cannot be combined with other promotions. – This Promotion’s PVs cannot be combined with DXN USA Holiday Promotion. 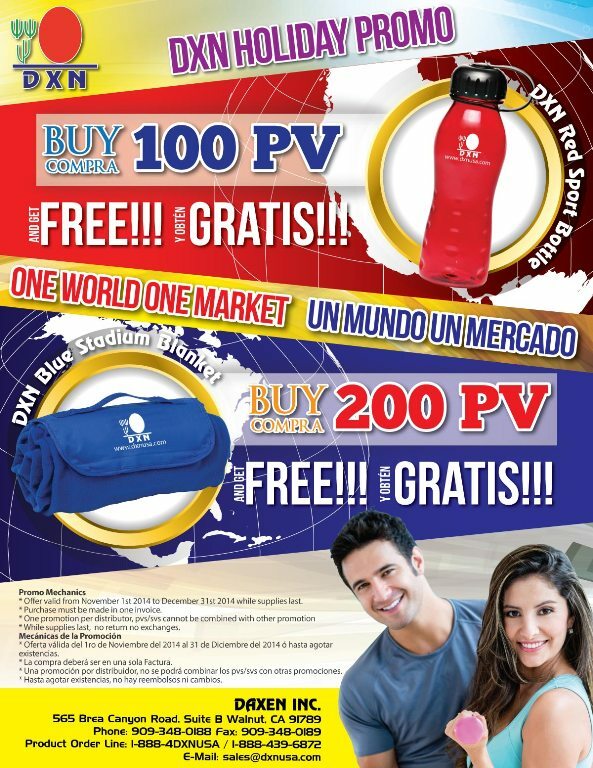 200 PVs and obtain a FREE DXN Blanket in a single invoice. – Offer is valid from November 1st 2014 to December 31st 2014 while supplies last. – One promotion per distributor, PVs/SVs cannot be combined with other promotions. You may buy DXN products cheaper on distributor price, if you register to DXN.